This little sweetie is Coconut, the second of our new semi-plush collection to be added to the website. 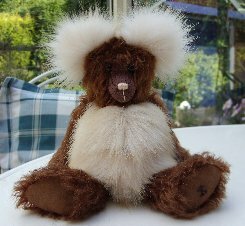 He is 8" tall and is made of gorgeous rich chestnut curly South African mohair whilst his tummy and ears are made of soft, silky, creamy plush fur tipped in the palest of apricot shades. This fur is very dense and has a lovely feathery surface texture which looks great. Coconut is steel shot, glass bead and plastic pellet filled for weight, he has deep chestnut brown cashmere pads and paws, a pale apricot stitched nose and shiny black German glass eyes. We are really pleased with this new range of semi-plush bears. The plush that we use, which is available in the most fantastic selection of colours, is too long and thick for small bears but is perfect for tummies and ears and the choice is huge so don't worry if you miss out on Coconut, we will be making more. Coconut costs £65 plus postage. Please note that as with all our bears, Coconut is not a toy and is not suitable for children. Sorry - Coconut has been adopted.